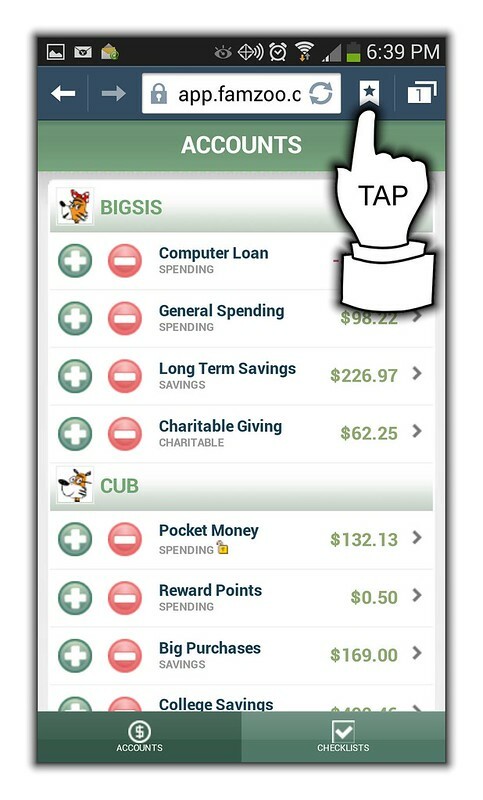 The FamZoo mobile user interface works great on Android phones. In fact, I use it every day on my Samsung Galaxy S4. 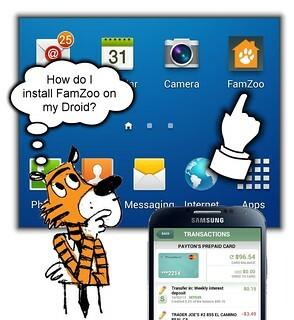 The trick is getting things set up so you can conveniently launch FamZoo with one tap from your home screen. You see, unfortunately, we don’t have a FamZoo app in the Google Play Store just yet, so you’ll want to follow this one-time recipe to “install” FamZoo on your Droid. 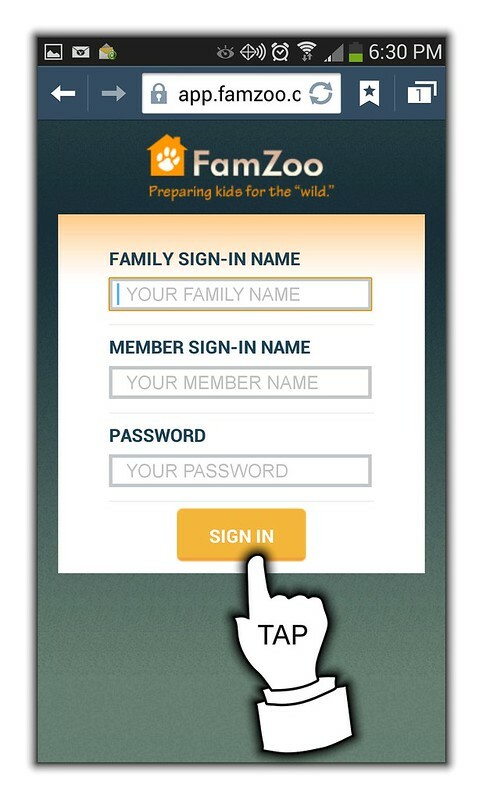 Sign into FamZoo on your mobile browser. Add the bookmark as a shortcut to your home screen. Note that FamZoo Mobile automatically keeps you signed in unless you explicitly scroll down and tap the Sign Out link in the bottom right corner of a page. So, unless you’ve done that, launching FamZoo from your home screen will take you right into the application. Just so you can see what it looks like to install FamZoo Mobile, here are the detailed screen-by-screen steps for the Android phone I happen to be using: the Samsung Galaxy S4 running Android 4.2.2 (aka “Jelly Bean”) using the stock browser. The steps will probably be fairly similar for different Android device/version/browser combos, but don’t hesitate to contact us if you’re having any trouble figuring out the recipe for your particular phone. Tap the Sign In button in the upper right corner. Enter your FamZoo credentials, and tap Sign In. 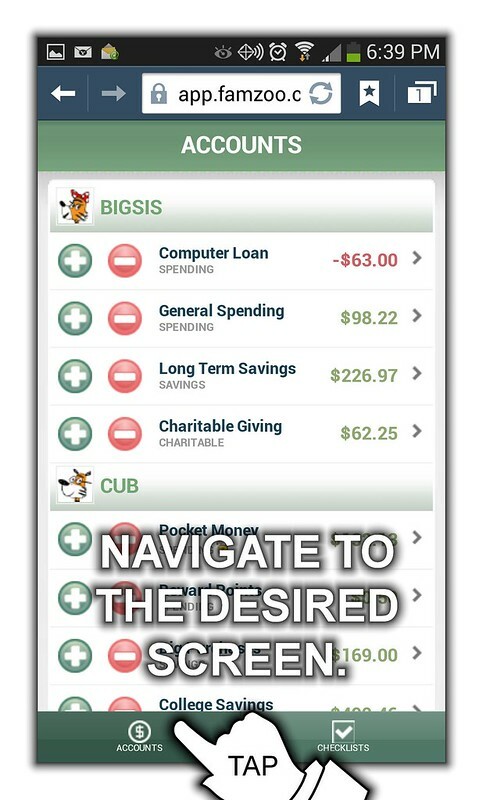 Navigate to the screen you’d like to show whenever you launch FamZoo. Bring up the phone’s menu and tap Add Bookmark. Note: you could just tap Add Shortcut here and be done, but I prefer to create a bookmark so I can give it a nice name (see next step). 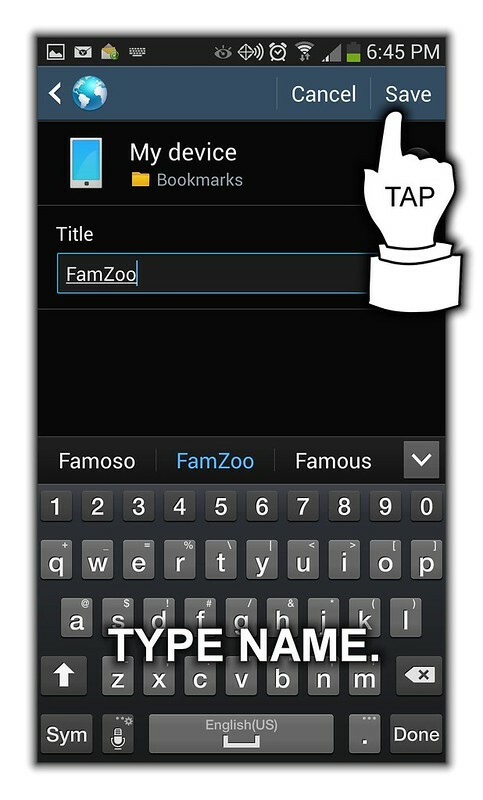 Type in a name for your bookmark like “FamZoo” and tap Save. 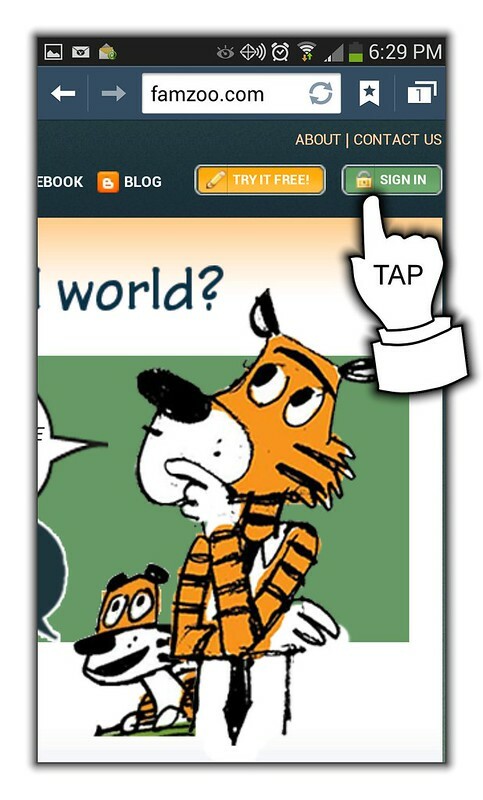 Tap the bookmarks icon to see the bookmark you just created. 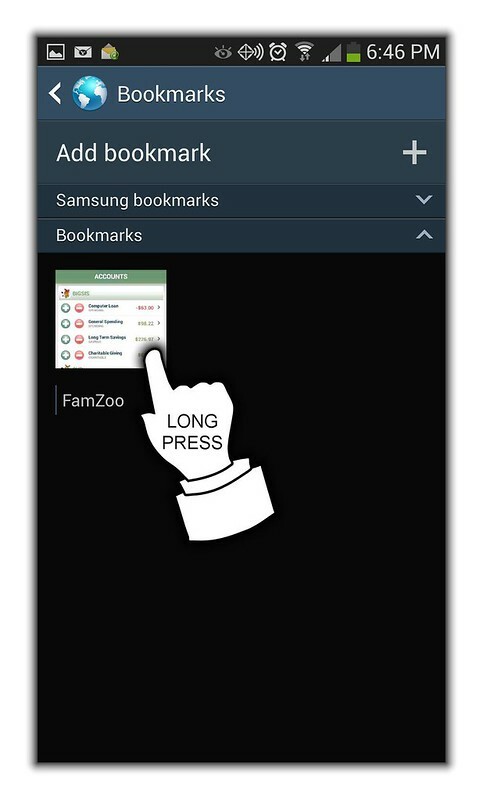 Long press (press down and hold) the FamZoo bookmark to bring up its menu. 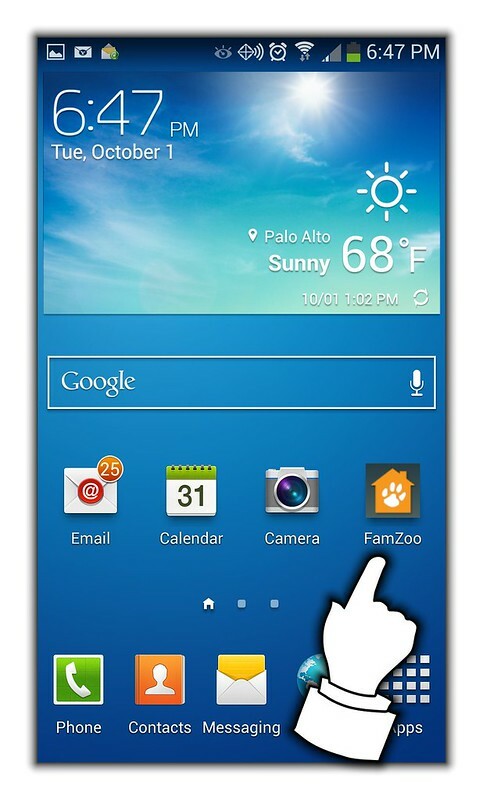 Tap the Add Shortcut menu item to place a FamZoo icon on your home screen. That’s it. 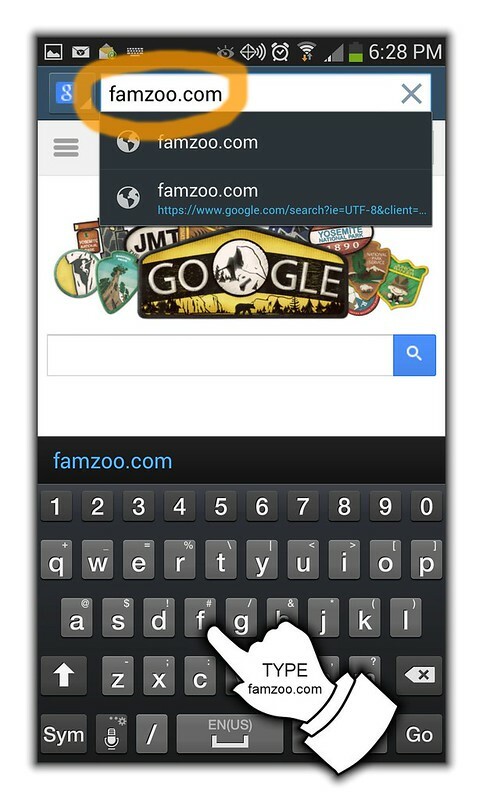 Now you’ll be able to launch FamZoo with one tap on your home screen. Saving bookmarks and shortcuts in Chrome for Android. Saving bookmarks and shortcuts in Firefox mobile. 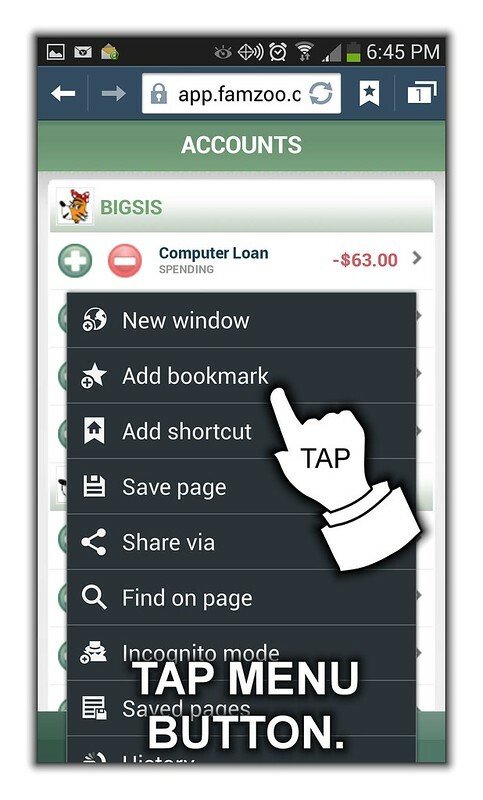 Saving bookmarks and shortcuts in the Dolphin Browser for Android. 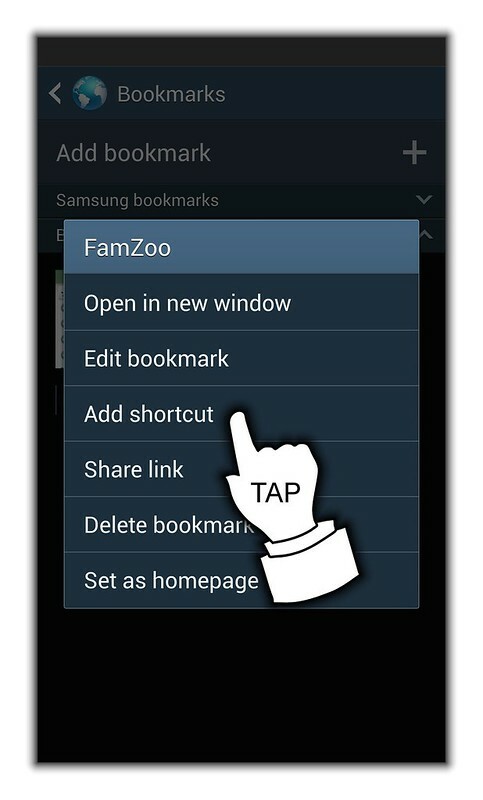 So you’ve successfully created a shortcut for FamZoo Mobile. Great. But how do you control where it ends up on your home screen? 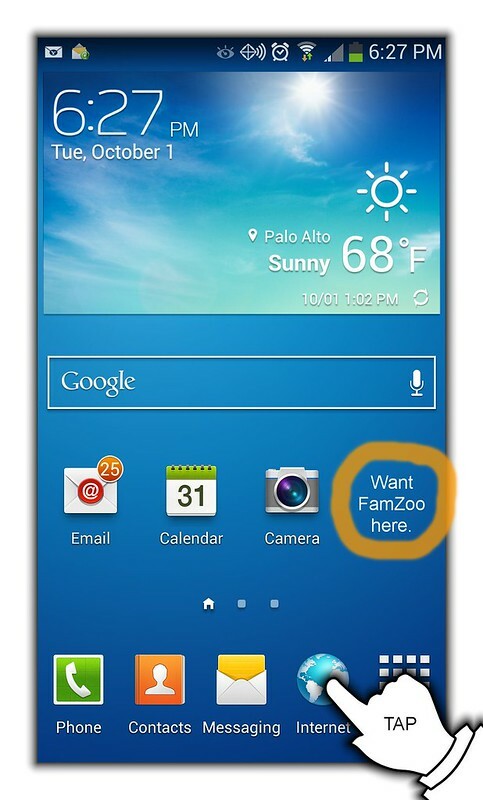 Maybe you have multiple home screens, and FamZoo is buried on some back screen. How do you move it closer to the front? Figuring out how to manage the shortcuts, apps, and widgets on your Android home screens can be surprisingly difficult and confusing — even for a lifetime geek like myself. I was stumped on a number of fronts until I stumbled upon this very helpful video for organizing your Galaxy S4 home screen. It’s packed with great tips for moving between your home screens, adding new screens, removing old ones, moving icons between screens, and much more. Plus, I love the fact that the narrator’s kids are making a ruckus in the background toward the end. FamZoo parents should feel right at home! Different Android phones have different tricks for managing the home screen, so if you don’t have a Galaxy S4 like I do, you’ll want to google around for a home screen tutorial that matches your device. If you find a good one, be sure to leave it in the comments below so others can benefit too. Please develop a native Android app. Many would benefit from this. Please make the app IPhone/Android, for kids is allot easier. Aftre all this is for kids. Thanks you. An update to this page for newer Android devices would be useful. In recent Chrome for Android, the option under the menu is now called "Add to Home Screen"
I am not sure if this is very user friendly. To many menus and difficult to set up. Green Light was a breeze to set up. Apologies for the rocky start. I appreciate your candid feedback. Please get in touch with me via the CONTACT US link (http://famzoo.com/contactus) so we can connect on the phone. I'd like to learn more about your difficulties with setup so we can continue to improve our product. I also want to be sure your setup matches your family's needs so you can get the most out of FamZoo going forward. When an item is checked off as completed on a checklist how do I know who completed it? Also can I create checklists for individuals and not "all kids" or "all family"?